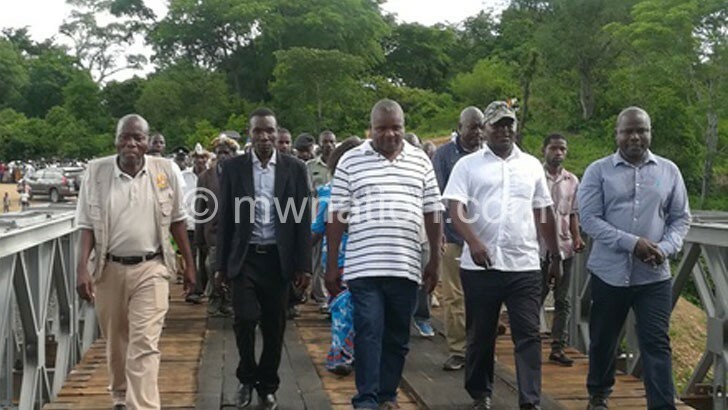 Minister of Transport and Public Works Jappie Mhango at the weekend commissioned four bridges in Neno, Phalombe, Chikwawa and Thyolo under the Roads Authority Rural Bridges Programme bridge programme. Speaking when he commissioned Lisungwi Bailey Bridge in Neno, Mhango said over 70 of the 97 bridges in the programme have been completed. He added that a similar programme will be roled out soon to cater for construction of bridges in areas that were left out in previous projects. “Government is committed to improving road networks and ease access to social amenities. We have a list of bridges we need to work on,” he said. On his part, Senior Chief Symon of Neno asked the minister to consider upgrading to tarmac the road from Lisungwi to Neno Boma to ease transportation challenges faced by people in the district. Phalombe district commissioner Memory Kaleso and Paramount Chief Lundu of Chikwawa hailed government for the projects, saying it will act as a driving force to economic growth in their areas. Roads Authority (RA) chief executive officer Engineer Emmanuel Matapa said the structures have a life span of over 50 years and can support loads of up to 35 tonnes.